I’m rarely satisfied. Good steak? The béarnaise sauce could have been more flavorful. Great muffin? Could have had more blueberries. Excellent Chardonnay? Didn’t quite work with the herbed goat cheese. I alway have ideas for improvement (and so does Jeff), so I never seem to make the exact same recipe twice. Because it can always be better, right? Well, almost. Every so often, once in a blue moon, a meal just works. And it’s perfection. Last night was one of those rare, perfect nights, and it was totally unplanned. 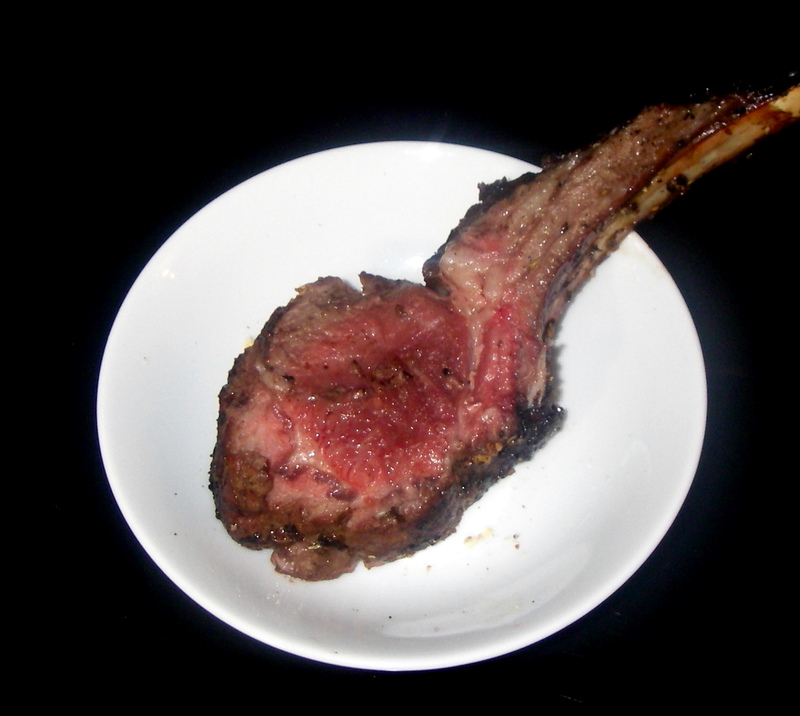 We had a rack of baby lamb chops in the freezer, a bit of generic garlicky grill rub hiding in the back of the cabinet. and a few spears of asparagus that just needed to be used up. Add a couple wedges of grilled pita, a dollop of tzaziki and it was a meal – ready in less than 30 minutes – that I will not rejigger. Ever. And the best part was the wine. I rarely talk about wine pairings here, but it’s something that we, Jeff especially, give quite a lot of thought. Jeff’s pretty unorthodox when it comes to matching wine and food. I’m a bit more rule bound, and advocated for La Noble Merlot last night. But Jeff insisted on the Oyster Bay Sauvignon Blanc (I know, white wine with lamb chops? sometimes it’s not worth the argument). And, as it turned out, he was so, so very right. The mineral undertones cut right through the rich, fatty lamb, and the floral notes worked beautifully with the asparagus. You can imagine the “I told you so” refrain that erupted in the kitchen. 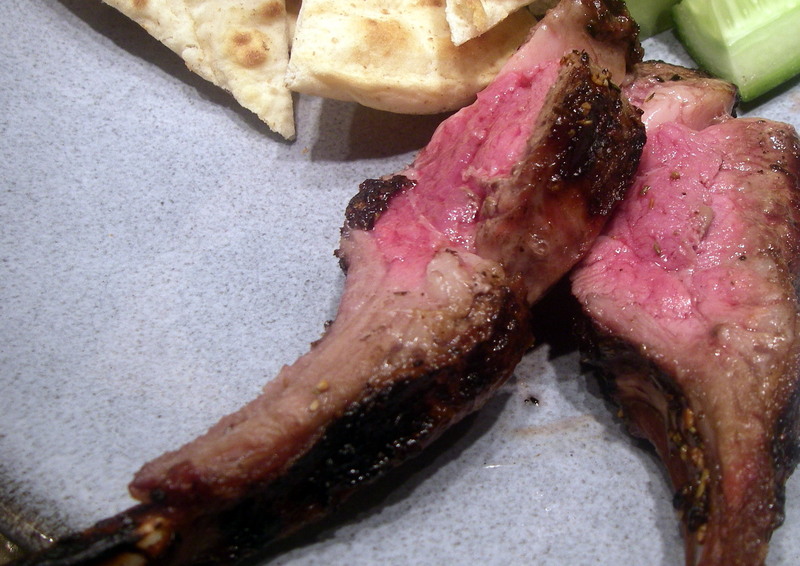 So, make these lamb chops. Today. Well, maybe not today since it’s raining. But soon. Very, very soon. They are so easy, and so fabulous – perfect food for entertaining. And while they look tiny, they are rich. You don’t need more than 3-4 little chops per person. If you want to grill asparagus along side, just toss them with a bit of olive oil and salt and thow them on a hot fire for a few minutes. And for those of you who are courageous, give that Sauvignon Blanc thing a try, If you do, let me know how it goes! Preheat a gas grill to high. 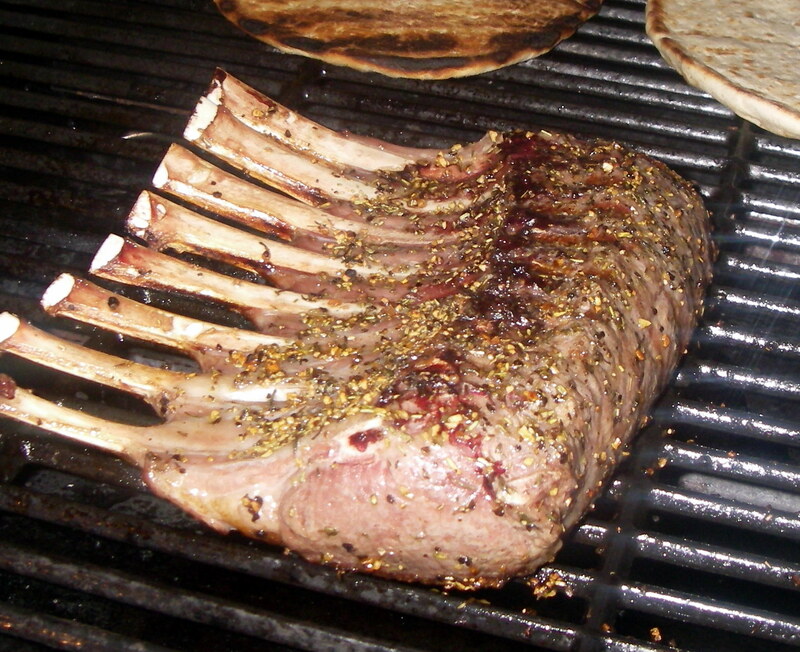 Rub the lamb evenly on both sides with oil, grill rub, and salt. 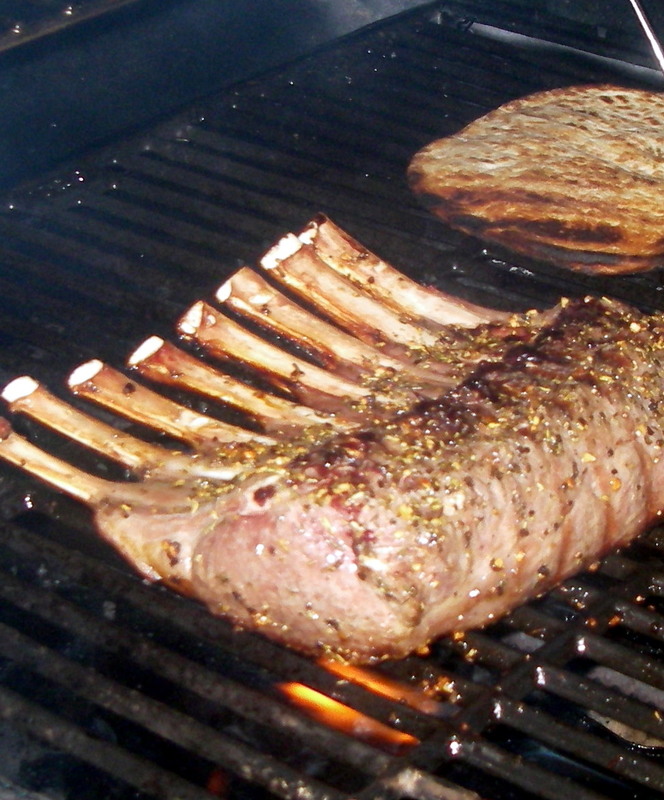 Grill the lamb over direct heat, turning to sear each side, about 2 minutes. Reduce heat, cover grill and cook about 8 minutes each side for medium rare. If needed, wrap the bones in aluminum foil to prevent burning. Let the lamb rest for a minute or two before cutting into individual chops. Cheesecake has just never seemed worth it to me. All those calories, and what do you get? Yeah, good New York cheesecake is creamy, but even the best tends to lack flavor, and I’m not a fan of that syrupy sweet strawberry drizzle. As for all those crazy chocolate, cookie, peanut butter, and caramel cheesecake concoctions… well, why not just eat a peanut butter cup? But this cheesecake is good. I mean really, really good. It’s the perfect balance of creamy and tangy and sweet. I do love key lime pie, but it can be an intense taste bud experience. 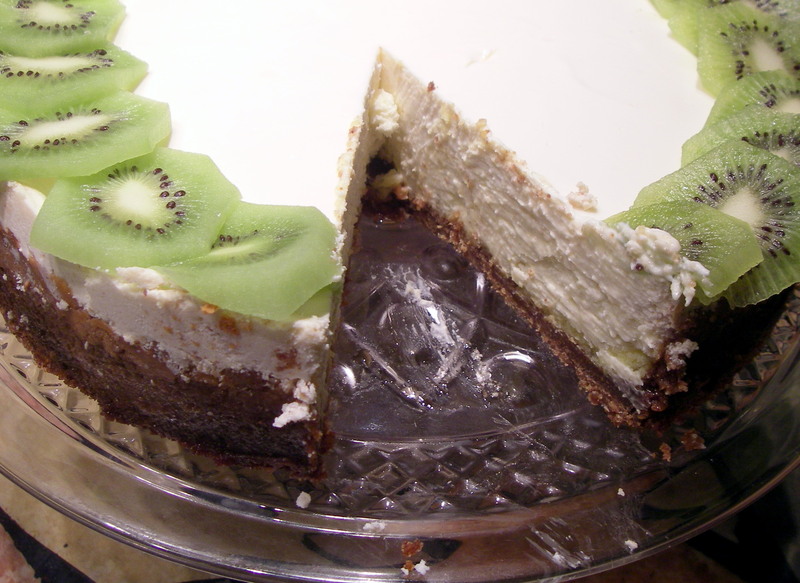 This key lime cheesecake, on the other hand, is smooth and delicate with just enough tart lime flavor to balance the richness of all that wonderful fat. If you can’t find fresh key limes, bottled key lime juice is just fine. But I wouldn’t suggest regular (Persian) limes here. 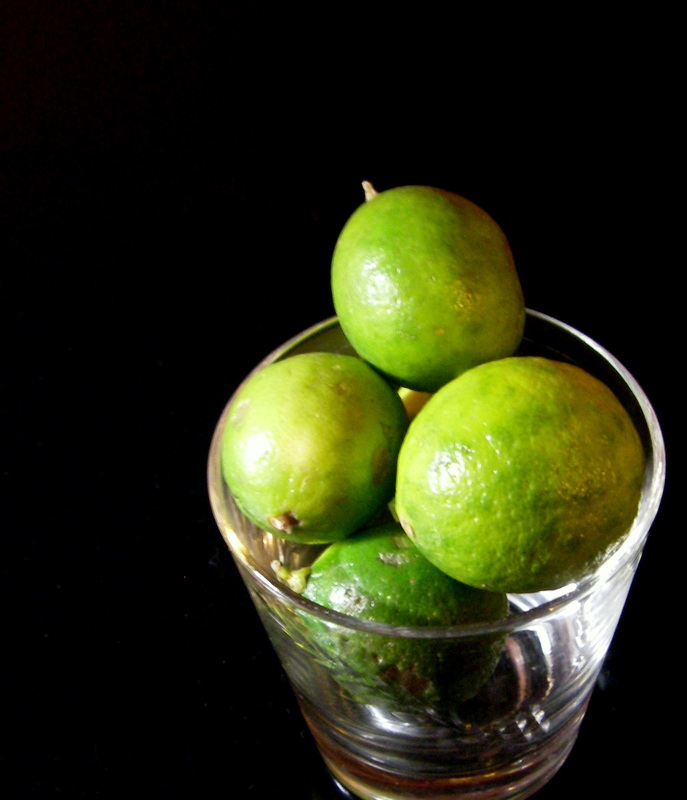 Key lime juice has a much more intense flavor which can’t be replicated with lime juice. When I was a teenager my mom took frequent business trips to the Florida Keys. She did her best to schedule them on school vacations and my brother and I tagged along. During one two-week stretch in Islamorada, Evan and I decided to embark on a quest, a key lime pie quest. We must have tasted more than two dozen key lime pies, some good some bad, but Manny and Isa’s was a clear winner (sadly they have since closed). We learned that we craved the creamiest custard, and that an overload of meringue really detracted from the pure, clean flavor of the key limes. I took these pie lessons with me when I started playing with the Key Lime Cheesecake recipe from Bon Apetit. 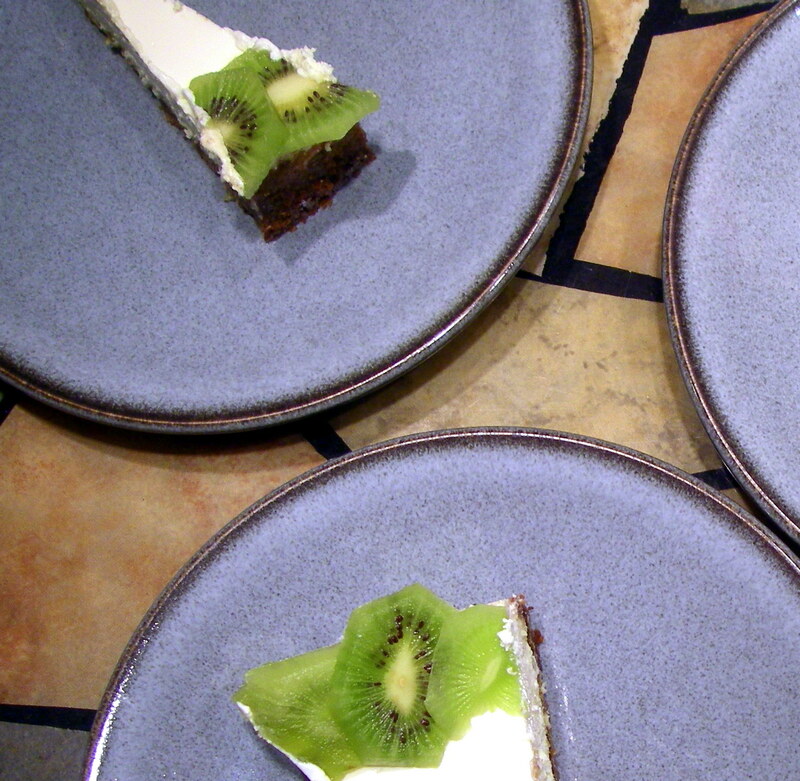 After a few tweaks and some pretty kiwi slices, we devoured this cake. To prepare the curd, combine butter, egg yolks, sugar, juice and zest in a heavy-bottomed saucepan over low heat. Wisk constantly until the mixture begins to thicken. Remove from heat and cool. Meanwhile, prepare the crust. Mix together the crumbs, sugar and salt. Stir in the melted butter. Grease an 8 inch springform pan with three-inch sides with cooking spray. Press the crumb mixture along the bottom and halfway up the sides of the pan. Place the springform pan on a rimmed baking sheet and bake in the oven until set, about 10 minutes. To prepare the filling, beat the cream cheese and all but 2 tablespoons of the sugar until fluffy, add in the eggs, juice and zest and beat to combine. Decrease the oven temperature to 300 degrees. Spread the curd on the bottom of the prepared crust, then spread in the filling mixture. Smooth the top of the filling and bake for 1 hour, until mostly set. Mix the sour cream with the remaining sugar. Remove the cake from the oven and spread the sour cream mixture over the top. Return to the oven for 10-12 minutes until bubbles form along the edges. Cool 1 hour at room temperature and then refrigerate overnight. To unmold, run a knife around the edge of the pan and then release. 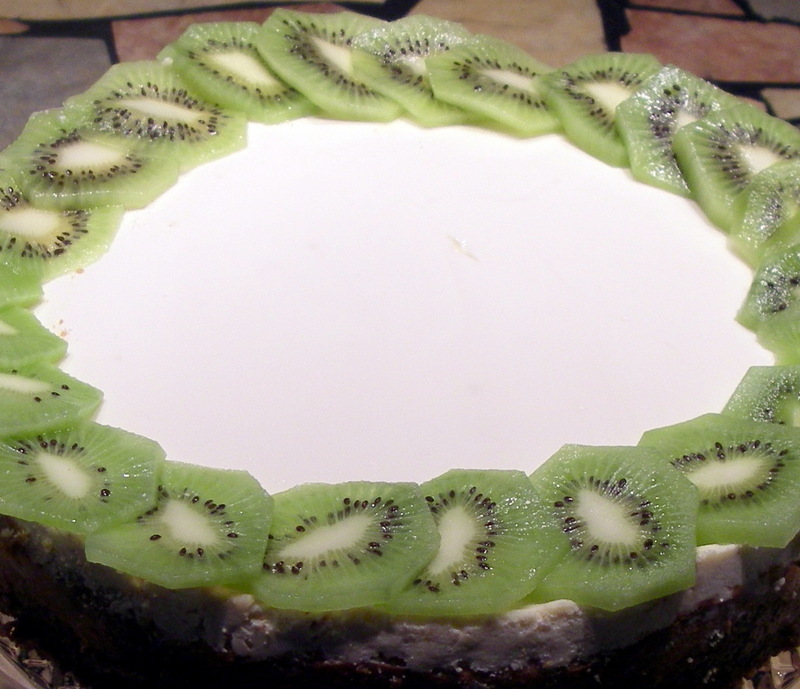 Just before serving, top the cake with the kiwi slices. I’ve been thrown for a loop in the past few days, and am still feeling a bit under the weather. But as far as I’m concerned, the road to recovery is paved with chocolate. And while I’m laid up on the sofa, there really is nothing I want more than a truffle, bursting with intense, creamy flavor and complete with a perfectly smooth shell. Thankfully, I’ve been on a chocolate-making jag in the last few weeks and have a store of bonbons large enough to sustain me as I recuperate. 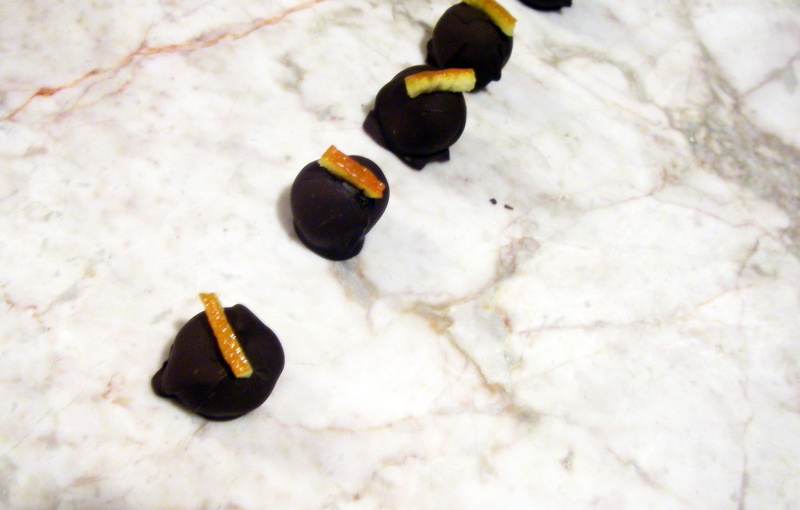 I even wrote about chocolate truffles for my latest column in the Dedham Transcript. 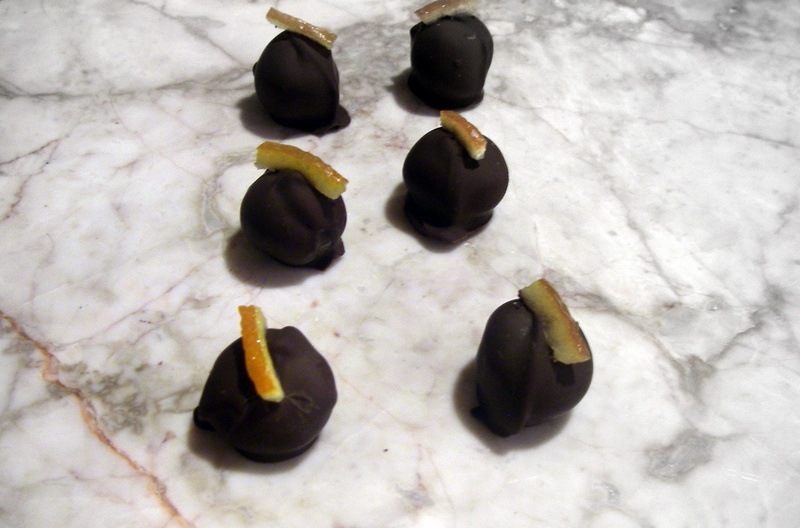 You can read about these lovely orange chocolate truffles here. As you’ll see in the Dedham Transcript column, I have carefully avoided the complicated topic of tempering chocolate. Tempering is simply the process of carefully heating, cooling and then reheating chocolate to allow the fat crystals to form in such a way that gives the outer layer of chocolate a shiny look and nice snap when bitten. Tempered chocolate keeps longer and does not get a white powdery fat layer called a ‘bloom’ that tends to appear on untempered chocolate. My favorite trick is that by simply never over-heating most brands of chocolate you can keep the temper, and not worry about it. This is not a fool-proof method, but if you expect your confections to be gobbled up too quickly for longer storage to be an issue, tempering is not a major concern anyway. So just very, very slowly heat your chocolate, trying to keep it at about 90 degrees, and never allowing it above 94 degrees, and it should retain its original temper. If you would like to properly temper your chocolate, it’s actually not that difficult. Just place half of your finely chopped dark chocolate in a bowl over a double boiler. Carefully bring your chocolate up to about 110 degrees, then remove from the heat and vigorously stir in by the handful enough finely chopped reserved chocolate to bring it back down to about 85 degrees (usually this requires about an equal amount of chocolate to what you already have melted in your bowl). Rewarm your chocolate slowly to about 90 degrees and hold at this temperature while you use the chocolate for dipping. You can hold the bowl over the double boiler occasionally to keep the temperature at 88-90 degrees, or you can place the bowl on top of an electric heating pad turned to its lowest setting and covered with a dish towel. Of course, there are a million ways to flavor truffles. Instead of orange liqueur you can add any liqueur (or fruit puree) you like to the ganache, and in terms of garnish, anything goes. My husband’s grandmother has dutifully taken a shot of ginger brandy every day for the past 70 years. She calls it medicine and given that she is 90 years old and not only living on her own, but still mowing her own lawn, I’m thinking there is something to this brandy. 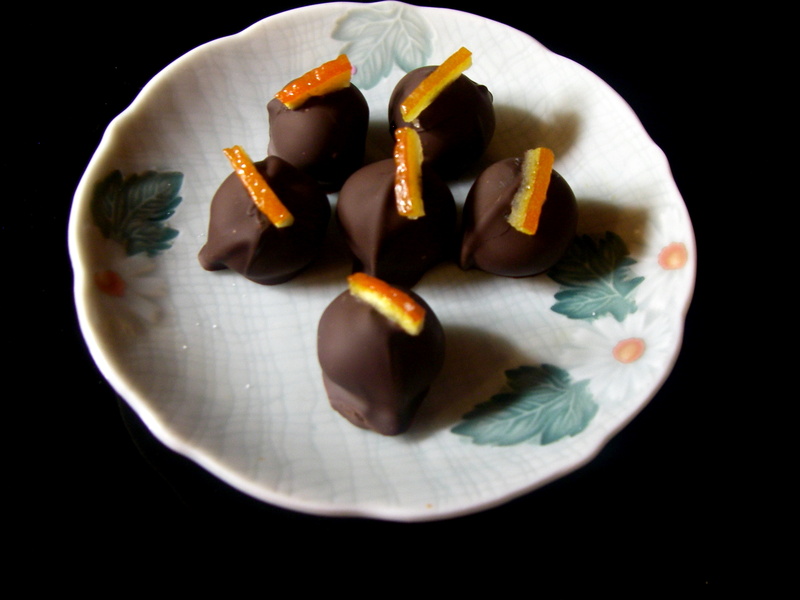 So my next endeavor is going to be these ginger brandy truffles, since speedy healing is what we’re all about here. I should be back with some lovely spring recipes soon (I am dying for asparagus salad and Jeff has been jabbering on about grilled lamb chops) but in the meantime, eat chocolate. Lots of chocolate! Melt half of the chocolate with the butter in a mixing bowl set atop a pan of simmering water. Remove from the heat and stir in the cream and brandy. Cover with plastic and refrigerate for at least two hours. Using a melon baler, scoop the ganache onto a baking sheet lined with parchment paper. Roll each scoop into a ball with your hands and return to the refrigerator for 30 minutes. Place the remaining chocolate in a mixing bowl and melt very slowly over a pan of simmering water. Do not allow the temperature of the chocolate to rise above 94 degrees or the chocolate will not have a nice sheen and snap to it. Keep the chocolate at about 90 degrees (by holding it over the pan of simmering water and removing as needed or by placing the bowl on a heating pad covered with a towel). Dip each truffle in the chocolate, shaking off the excess, and place on a parchment-lined baking sheet. Garnish with a slice of candied ginger. Allow truffles to set in a cool place. I meant to tell you all about this the very first time I made it. But somehow I just never got around to it. And that’s a shame. Because this meatloaf is fantastic. Beyond fantastic. My mom made meatloaf, with ketchup and plenty of garlic powder, and I loved it in the same way I occasionally still crave macaroni and cheese from a box. 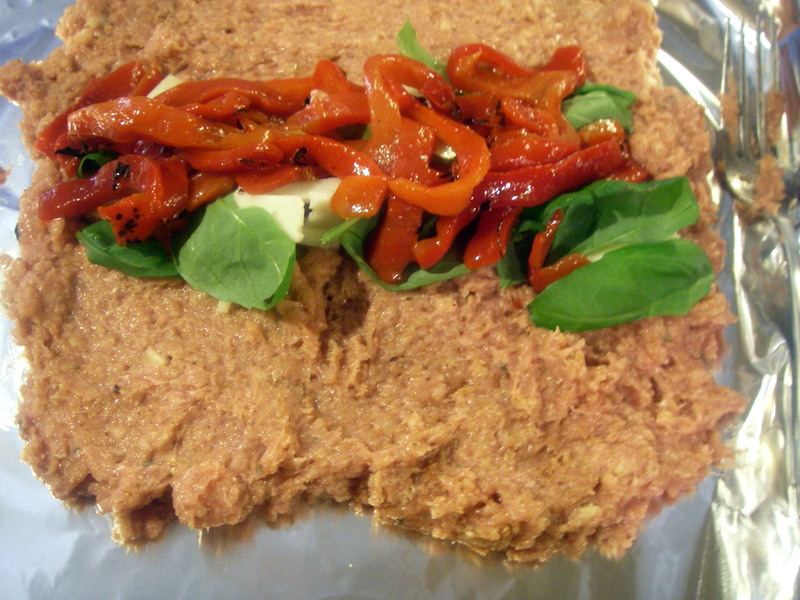 But trust me, this is NOT your mother’s meatloaf. This is fancy meatloaf you could serve to company, although I don’t know why you would since it’s so much more fun to eat it all yourself. 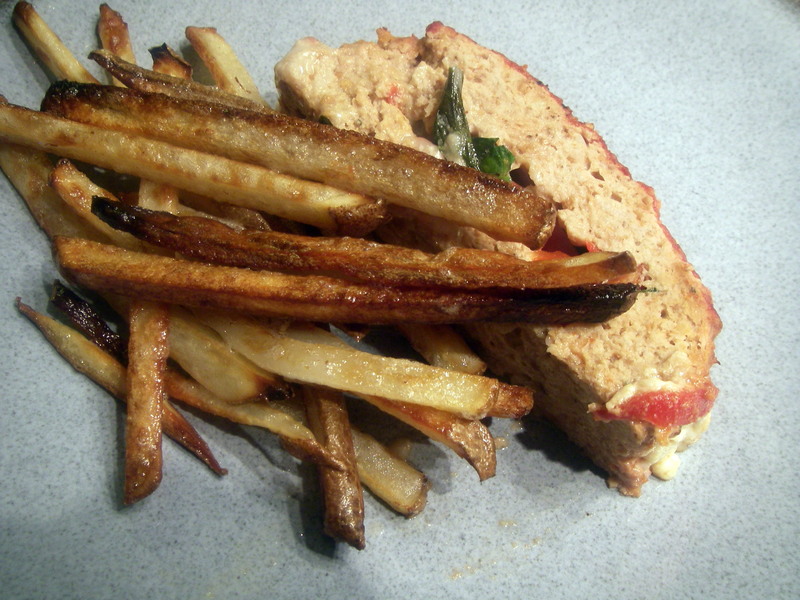 Of course it’s still simple and easy, and goes great with oven-baked fries. It is meatloaf, afterall. If you’ve never made stuffed meatloaf, the juicy interior will surprise you. 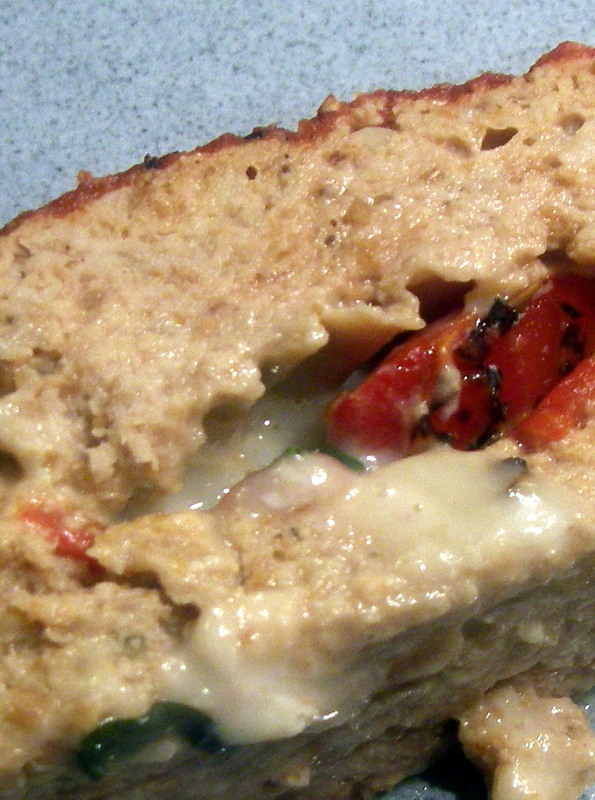 Sweet roasted peppers and gooey cheese keep the meatloaf wonderfully moist from the inside. You could certainly replace the peppers with roasted tomatoes and the provolone with Roquefort, or even use roasted peaches and camembert for a decadent twist. I use ground turkey because I think that the mild flavor allows the peppers, cheese and basil to shine, but you could choose ground beef, or even veal if you like. Preheat the oven to 400 degrees. Mix together the ground turkey, eggs, bread crumbs, garlic, and one quarter of the tomato sauce. Add salt and pepper and mix well. Spread the meat mixture in a square on a piece of foil. Arrange the peppers, basil and cheese down the center of the square, stopping an inch from each end. Using the foil to help lift, roll the meat mixture around the filling and pinch the ends to form a loaf. Transfer the meatloaf to a greased rimmed baking sheet. Spread the remaining sauce over the top of the meatloaf, and sprinkle with additional salt and pepper. Bake about 45 minutes until fully cooked through.